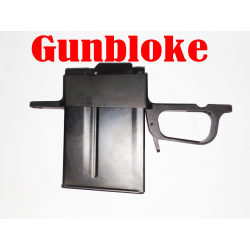 Wild Dog Detachable Magazine Kit - accepts Accuracy International & compatible Magazines. 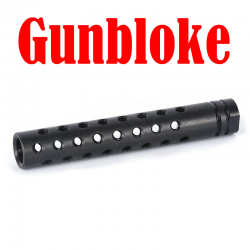 THE EXTERMINATOR Reverse Venting muzzle Brake offering a huge 70% recoil reduction with compensation. The TRIPLE-TAC1 - offers up to 70% recoil reduction with it's unique reverse venting design. 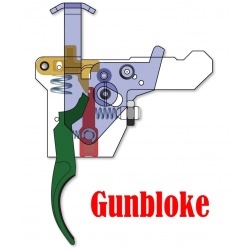 To suit the 2 stage HACT Trigger - Improve your factory trigger. 100% reversible. Maximum Recoil Reduction for Long Range Precision Rifles. Symmetrical Blast Chamber promotes a balanced gas flow for reduced bullet yaw and maximum accuracy potential. Stress optimized baffles diminish in thickness to minimize bore aperture wall surface and reduce baffle/projectile interaction. 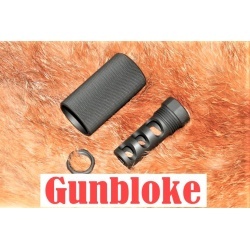 Delivers recoil energy reduction of 70% or higher for many cartridges. Closed bottom minimizes dust signature when shooting prone. Top venting gas ports provide significant reduction in muzzle climb/jump. Angled “V” shaped blast baffles divert reflected blast above and below shooters ear for lower perceived concussion and noise. 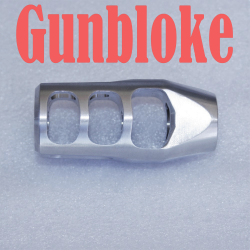 Machined from high strength marine grade stainless steel bar. 5/8x24 TPI thread featuring High pitch diameter tolerance class 3B threads machined in the same operation as the bore ensures a perfect concentricity, this combined with a progressively decreasing baffle thickness and maximized venting area significantly reduce bullet flight disturbance resulting in less yaw, higher BC, and improved accuracy. 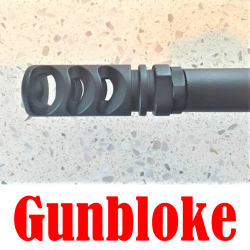 The Gunbloke Clamp on muzzle brake kit Bundled with the EXTERMINATOR reverse venting muzzle brake. Made to suit your barrel. 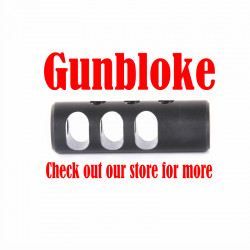 NO OTHER CLAMP ON MUZZLE BRAKE comes close. PLEASE NOTE - THIS IS A CUSTOM CLAMP ON ASSEMBLY & WILL TAKE APPROX 21-28 DAYS FROM ORDER. We need measurements of your barrel at the muzzle and 1.625″ back in thousandths of an inch. Using good quality calipers or a micrometer take several measurements around the barrel at these two points and average each. 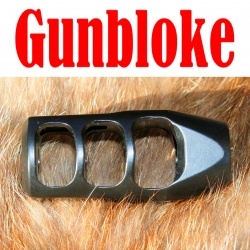 Using a DIAL CALIPER or MICROMETER measure the diameter of the barrel at the muzzle and 1.625" from the muzzle. Please be as exact as possible to ensure we machine the correct diameter bore into your adapter. 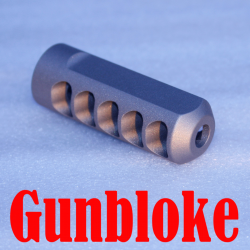 The Gunbloke Clamp on muzzle brake kit Bundled with the ELIMINATOR muzzle brake. Add threads to a barrel without threading the barrel! The most clamping force on the market. 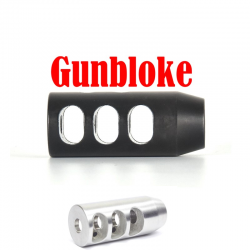 available in nearly any caliber and threaded 5/8-24. 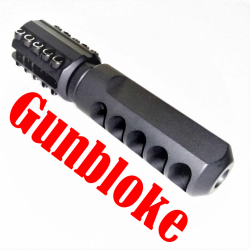 "THE ELIMINATOR" Muzzle Brake & Compensator provides recoil reduction with reduced muzzle blast. 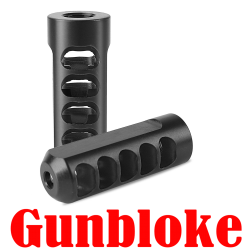 5/8x24 TPI thread featuring High pitch diameter tolerance class 3B threads machined in the same operation as the bore ensures a perfect concentricity, this combined with 3 symmetrical blast baffles redirect gas to the sides and upward delivering unparalleled recoil reduction while also minimizing muzzle rise and ground disturbance. Accepts Accuracy International & compatible Magazines. Includes lock nut to suit. 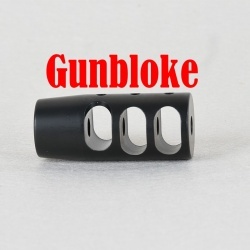 THE EXTERMINATOR Muzzle Brake Compensator features 5 large expansion chambers which dissipates then directs the gases to the side and rear through the precisely canted vents. 70mm OAL, 24.7mm dia, 120gr. Machined from high strength steel bar. 5/8x24 (5/8" UNEF) thread 58mm OAL, 22mm dia, .73.7g. 1/2-28 TPI thread featuring High pitch diameter tolerance class 3B threads machined in the same operation as the bore ensures a perfect concentricity, this combined with a progressively decreasing baffle thickness and maximized venting area significantly reduce bullet flight disturbance resulting in less yaw, higher BC, and improved accuracy. Don't waste your money on an aftermarket trigger when your factory trigger is a much better design. We have thoroughly tested our spring kits & shoot what we sell. 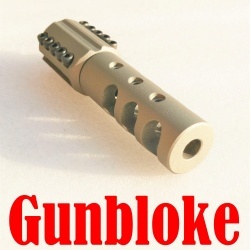 1/2x28 TPI thread featuring High pitch diameter tolerance class 3B threads machined in the same operation as the bore ensures a perfect concentricity, this combined with 3 symmetrical blast baffles redirect gas to the sides and upward delivering unparalleled recoil reduction while also minimizing muzzle rise and ground disturbance. No bottom porting, won't throw dirt up in your face. 3 symmetrical blast baffles redirect gas to the sides and upward delivering unparalleled recoil reduction while also minimizing muzzle rise and ground disturbance.